Whether you’re getting married yourself or you are helping a friend or relative to organise their big day you’ll know how important keeping to some of the old wedding traditions is. Wedding traditions have been around almost as long as marriage itself and are designed to give the bride and groom good luck on their wedding day and to ensure that they have a long and happy marriage. Most people have heard of the rhyme “something old, something new, something borrowed and something blue” which describes the four things that a bride is meant to wear as she walks down the aisle. However in the 21st century we’re seeing many couples take a new twist on many wedding traditions and it’s fascinating to see how they are evolving over the years. Here are some ways that that we have seen brides updating wedding traditions and giving a modern flavour to a time honoured ritual! We’ve seen a big change in the way that brides and grooms want to capture their big day. Instead of staid family groupings we are seeing a move towards action shots and photographers who capture the real spirit of the day with natural poses and candid images. Engagement shoots are also becoming really popular as couples choose to celebrate the moment they propose on film. As technology evolves we are also enjoying some great video footage of weddings and many couples are even choosing to use editing apps to create their own special memories. Once upon a time an invite dropped onto your doormat which often included a large bundle of maps, gift lists and menu details. Now you’re more likely to get an invite dropping into your inbox as many brides and grooms are choosing to take their wedding organisation online. Lots of couples are creating their own wedding websites as a great way to store information and keep everything in one place. They are also taking advantage of social media by setting up wedding Facebook pages and hashtags for their guests to share photos of the big day, and it’s a lovely way to keep a record of such a special occasion. Traditional vows are also on their way out with more and more couples deciding to write their own vows that they feel are unique to their relationship. These can range from the humorous designed to give their event a lighthearted feel to the seriously romantic which will have the congregation in tears! We think this is a lovely new tradition and makes your wedding totally authentic. Whilst it can seem daunting having to think of your own words to say you won’t regret adding this individual touch to your big day. Of course all of the old traditions had to start somewhere and we’re seeing plenty of innovative additions to weddings that we think are going to start becoming traditions. 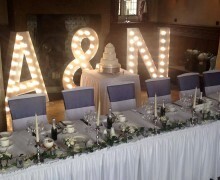 Light up letters are really popular and we think that a picture of the bride and groom in front of their initials in giant light up letters creates an amazing memory of such an important occasion. Personalised favours will also stand the test of time with couples using everything from home made jam to personalised t-towels to thank their guests for coming to their big day. We’ve also seen a rise of wedding poem writers on twitter who capture the big day in words and there are great new ideas springing up all the time! If you’ve had a great new twist on an old tradition we’d love to hear from you! ← What’s your wedding dress style?